Cao Bá Hưng, in his teens, can play more musical instruments than the number of years he’s been on this earth. If this is unusual, what really sets this young man apart is that he has chosen to focus his talents on something other than instruments – song writing. The 18-year-old began learning to play instruments when he was just eight. 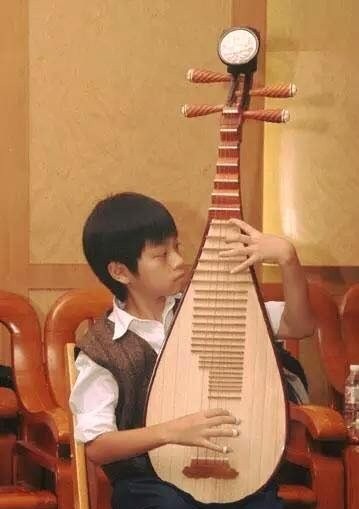 Now, he can play the piano, the guitar, tỳ bà (four-stringed pluck instrument), đàn nguyệt (moon-shaped two-chord guitar) and đàn đá (lithophone), Vietnamese traditional drum and more than a dozen other instruments. Hưng’s felicity with so many instruments was in keeping with his father’s wish that he becomes a talented player, but the son’s passion for composing and music production saw him deploy his muse in another direction – by writing songs. His multiple talents caught the nation’s attention this January when he won the Sing My Song Việt Nam reality show. 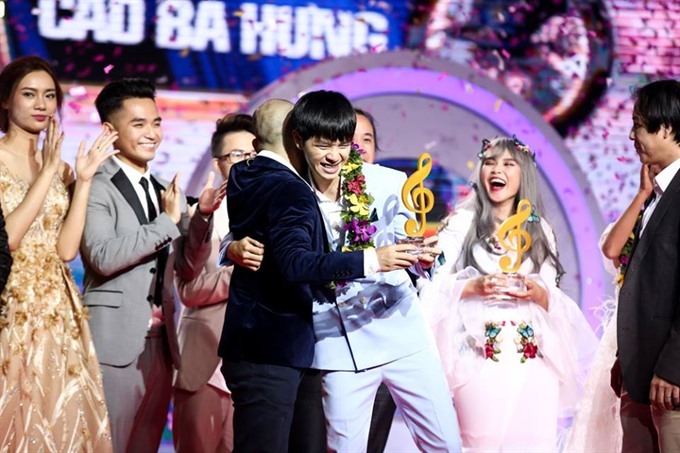 He impressed the audience and all four judges as soon as he set foot on the stage, donning an áo dài, Vietnamese traditional dress and holding a fan in his hand. His very first performance of Tương Tư (Lovesick) did not disappoint. The audience was charmed by the combination of Vietnamese folk melodies and rap lyrics. “That a young person like Hưng is passionate about folk music will promote this genre meaningfully. This is more valuable than anything that we are trying to do to promote it,” said composer/judge Đức Trí. “At 18, this [Hưng’s performance] is amazing. I really like the folk music in the composition. Even without the traditional long dress and khăn xếp (Vietnamese traditional headgear like turban worn usually when traditional music is performed), we still feel the folk music in you,” composer/judge Lê Minh Sơn commented after Hưng’s Tương Tư performance. By creatively using traditional musical instruments like the Baranưng drum, flute and đàn nguyệt, Hưng incorporated Vietnamese folk music into almost all of his works performed at the Sing My Song contest, including Tương Tư (Lovesick), Kiều (Kiều) and Có vấn đề (There is a Problem). His songs were highly valued by the judges for the way the lyrics matched the language of folk music. At a time when most youth seem more drawn to music from the West or Kpop, Hưng seems to stand out, not just for his love for folk music, but for his strong desire to popularise the genre, especially “among the youth”, as also attract public attention to Vietnamese literary works. Hưng, currently a high school student in HCM City, was born into a family with a strong musical tradition, but says he was more fascinated with technology. By six, he had already learnt to work on Photoshop and design websites. However, it was not long before music claimed his undivided attention. 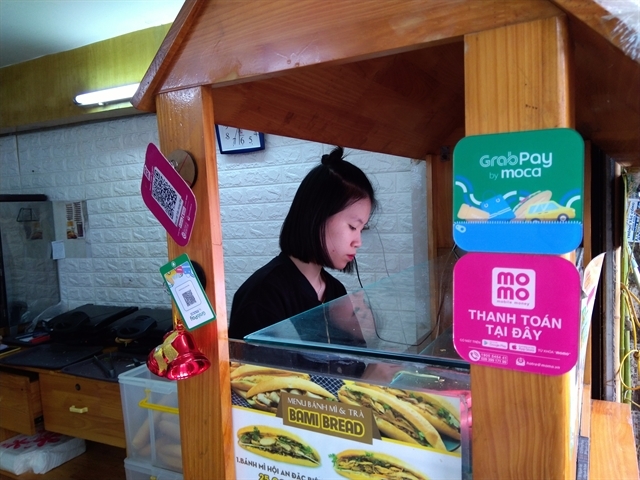 “When I live with music, I feel like I am being the fullest person I can be,” said Hưng. Having begun to learn the piano when he was eight, Hưng was selected to study at the Guangxi Art Institute in China with a scholarship for young talents from the HCM City’s Department of Culture, Sports and Tourism, majoring in traditional music. He was just nine. 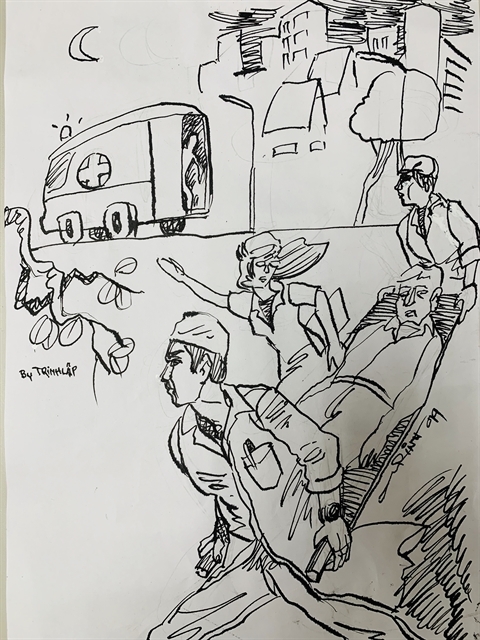 “My cousin and I travelled back and forth between Việt Nam and China by ourselves, flying from HCM City to Hà Nội and then taking the train on a journey of many hours. A lot of pluck: Hưng playing the tỳ bà (four-stringed instrument) in 2009. He was sent to study at the Guangxi Art Institute in China under a HCM City scholarship programme when he was just nine. “Actually, it is now, when I think back to that time, that I feel a bit scared. I was just nine. 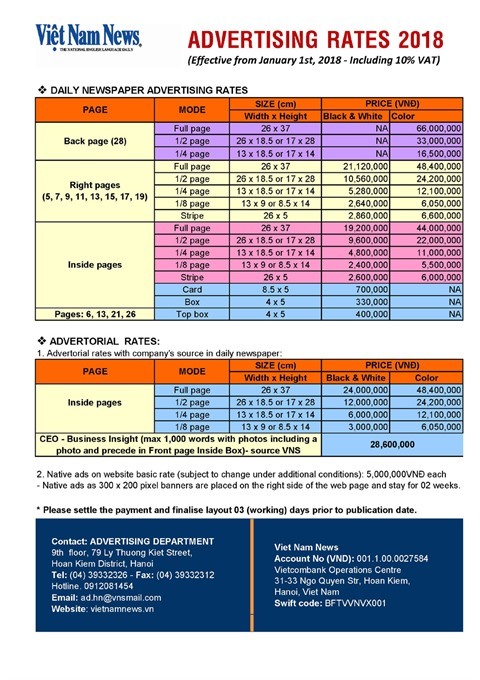 But then, I was just homesick,” Hưng told Việt Nam News. In July last year, Hưng had chance to perform with Vietnamese artists in Russia under the Việt Nam-Russia Culture Exchange Programme. 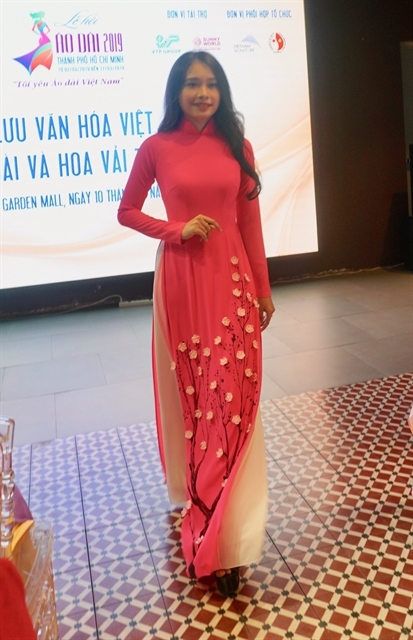 “Though it was not a solo performance and audience may not have known me, it was such a pleasure that I had a chance to perform with leading artists of Việt Nam,” said Hưng. Such experiences inspired him to stay true to his deeper motivations. “I had to struggle quite a lot in shifting from playing instruments to composing. My parents wanted me to become a good instrument player and be able to play several instruments. When I was small, I set my own target to play music instruments for at least eight hours a day but eventually I could never make it (my mainstay),” he said. Hưng had showed an aptitude for composing and choreographing when he was 13. “When I was 13, I liked a girl two years older than me at school. I wanted to tell her this, but did not know how to do it so she would be really impressed. I sat by the piano and composed my first song. 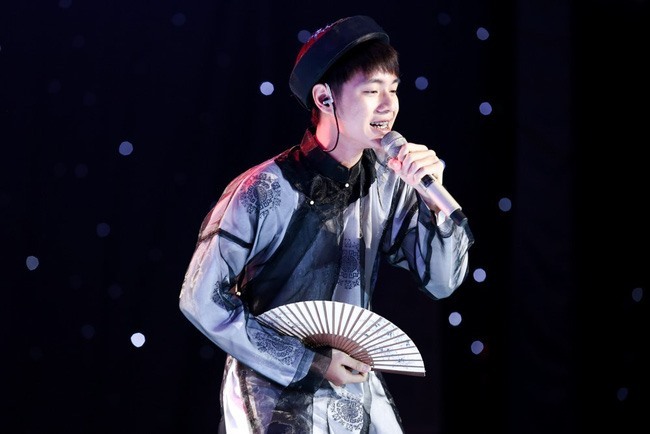 Looking the part: Dressed in a traditional áo dài and holding a fan in his hand, Hưng impressed the audience and judges with his Tương Tư (In Love) composition at the Sing My Song reality show in January. In 2014, Hưng and his four-member group Bốn Chị Em (Four Siblings) – a traditional music instrument band, competed in Việt Nam’s Got Talent, but did not go very far in the competition. Besides singing, he also collaborated with other artists as a songwriter. “I have long been fond of poetry and have written quite a few. But the readership for poetry is limited, and I love music. My focus is still music,” said Hưng. “Most of my songs take their lyrics from my poems. My works are inspired mostly by my own stories and experiences. Tương tư in Sing My Song, which is about the feelings of a lovesick boy, is one of them. “Through my compositions, I would like to bring Vietnamese literature and traditional folk music closer to audience, especially young people. Hưng’s compositions for the show were mostly of folk music. However, the teenage is also open to other music genres. “I don’t think that an artist should pursue only one genre of music. For me, wearing hip-hop style clothes or having their hair dyed doesn’t mean those people lack appreciation for folk music. I myself also love modern music. Besides traditional music, I have written songs for rap, EDM and jazz,” he said. Sometimes, Hưng is inspired to combine folk music with modern music. This way, the audience will receive folk music more easily, he feels.